Palisades Park perches precariously on a series of tall bluffs, a stunning face of nature that enthralls visitors as much as the sighting of a Hollywood actress, but it has also succumbed to the erosions of time as any mortal. Geologists describe the bluffs as "fragile Pleistocene age alluvial deposits with near-vertical slopes and peninsular soil columns." Natural landslides, slip outs, or other slope failures have plagued the bluffs. Causes are many: including poor drainage, groundwater seepage, earthquake shaking, and animal burrows, and human compaction of the Park's soils. Below, crews in a "cherry picker" drill holes and place 40 foot long "nails" into the face of the bluffs as part of the bluff stabilization plan. What is a Soil Nailing? 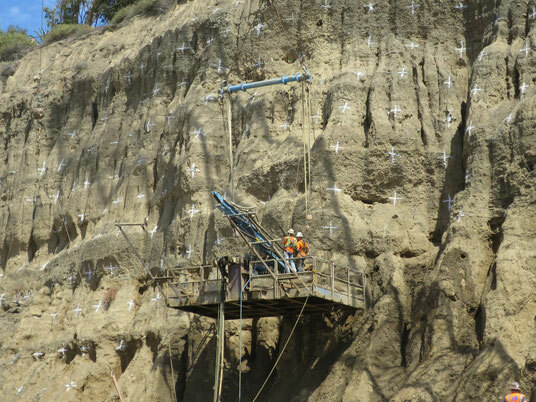 Installation of soil nails involves drilling arrays of small-diameter holes in the bluff face. See the "X" markings on the bluff face. Engineers plan to drill holes and install forty foot galvanized steel "nails" into the face. They then will "grout" the boreholes to establish a bond between the pipes and the surrounding soil. In order to help maintain the natural appearance of the Bluff’s surface the soil nails may be installed without washers. Soil nails are used to stabilize the Bluff’s from the toe up the bluff face to the bluff rim. The soil nails are used in combination with the other measures to increase stability of bluff face, erosion pockets, gullies, peninsular columns, overhanging blocks and tension cracks along the entire length of the Bluffs. The Bluffs consist of relatively fragile Pleistocene age alluvial deposits with near-vertical slopes and peninsular soil columns. Along the toe of the Bluffs, a densely vegetated, gently sloped mass of loose soil and debris (talus) from the Bluffs has accumulated, particularly northwest of the California Avenue Incline. Over the years, the Bluffs have steadily receded due to natural causes including weathering, surface erosion during heavy rainstorms, localized slope failures caused by groundwater seepage, earthquake shaking, and animal burrows. Some of the slope failures have been large enough for slide debris to cover several traffic lanes of PCH. Surface drainage improvements in the Park, recently undertaken by the City of Santa Monica, have been effective in reducing erosion damage from stormwater runoff, as well as limiting water infiltration behind the bluff face. However, other factors including groundwater seepage from more distant regional sources, animal burrows, bluff face erosion from direct impact of rainfall, and fractures created by previous rainstorms and earthquake events, continue to take their toll. 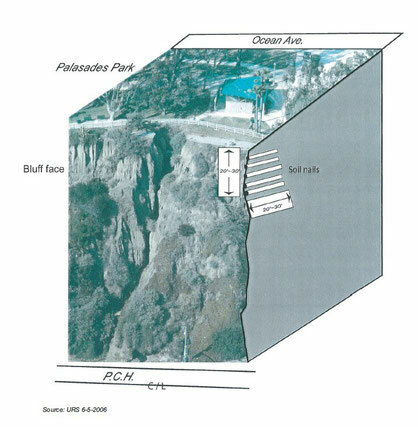 The proposed project includes several techniques intended to improve the stability of the Bluffs and Palisades Park. The following description includes methods for overall bluff stability and safety, and techniques intended to individually stabilize the bluff rim, bluff face, and bluff toe, photos of which can be seen in Figure 2-5. Horizontal drains, or hydraugers would be installed by drilling 100 to 300 feet into the bluff from the toe. Boreholes are drilled at an angle of 5 to 20 degrees from horizontal. Then perforated pipes (usually 1 to 3 inches in diameter) are inserted to serve as drains for groundwater to dissipate by gravity flow. The collected water would be routed to storm drain catch basins along PCH. Such systems were installed as part of the slope repair following the 1998 landslide and proved to be successful in removing excess water. The typical installation of a hydrauger is shown in Figure 2-6.
hydraugers that are merely dripping are likely to be effective. The upper surface edge, or rim area, of the Bluffs is subjected to surface erosion from stormwater runoff and direct impact from rainfall, but may also experience slope failure. The latter develops as the rim gradually deepens and/or is being undermined by the sloughing of deeper soil layers, which intersect the bluff face below the rim. The improvement measures for the bluff rim are aimed at increasing the resistance to surface erosion, as well as strengthening the soils in the upper 20 to 30 feet of the bluff face by mechanical means. As such, the improvement of the bluff rim may be accomplished by implementing a combination of some, or all, of the measures discussed below. In order to increase erosion resistance of exposed surfaces along the Bluffs, including pinnacles, noses and peninsulas, a form of “spray on” chemical grouting developed for in-situ soil treatment would be used. This involves saturating a surface soil layer with grout consisting of water-reactive polyurethane prepolymer by means of surface spray. Once sprayed on the soil surface, the grout is absorbed by capillary action as it displaces existing air or fluid in the pores of the soil and bonds to soil particles forming a thin crust a half inch to an inch thick, depending on the soil type. In larger areas, the protective surface layer would be anchored to the underlying soil by a pattern of short soil nails, or “stitches.” The latter would consist of a pattern of perforated steel pipes, or strainer tubes, drilled or driven into the surface and grouted in place. The tubes would be cut flush with the bluff surface and patched with a mixture of natural soil and grout to restore the natural look of the surface. Additionally, short perforated moisture-relief pipes or breather tubes would be drilled or driven into the grouted surface in approximately 10-foot intervals to provide drainage for water accumulating behind the treated surface.